8:41 this user is letting us know there is an issue. We respond with a “we’re on it, thank you” type message. 8:42 user has decided she dislikes our app and will delete it. 8:46 user has taken a moment to look around for other people who might be having issues. She finds one plus adds James Spann to the tweet for good measure. Might as well kick the dog while it’s down, right? 9:03 11 minutes has passed and the user has circled back around and decided to be mad at us again. Fortunately she didn’t have enough characters remaining to wrangle additional twitter attention. 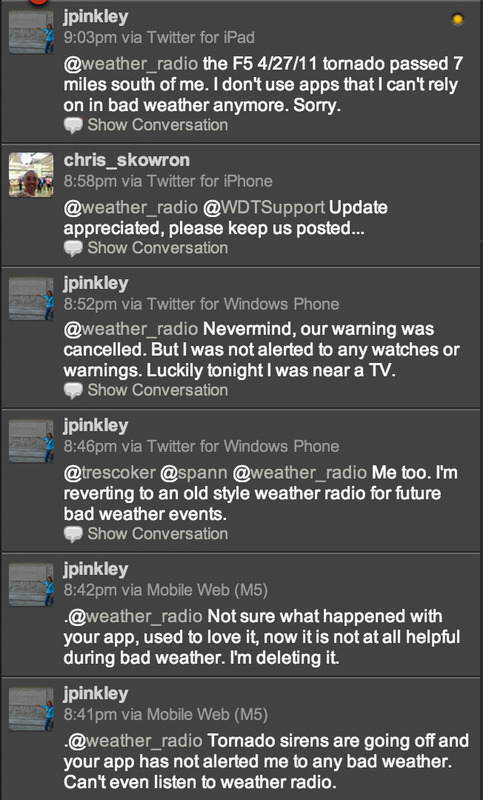 As I write this a whole bunch of people are working their fingers to a nub to fix this problem and make Weather Radio work great for everyone, regardless of location. We offer 24/7/365 support in order ensure these problems are solved in the quickest way possible. No other weather application offers this type of service to it’s users. May 16 Storm Chasers Are Hideous News Gatherers - Yes or No?